We’ve talked about vinaigrettes in the Mother Sauces section. This is a lower calorie version with huge flavor and it still has the mouth-feel of the higher fat version. The reason…gum. Not the kind you chew for fresh breath or bubbles, xanthan and guar gums. Anyone who is gluten-free knows about this, but they usually use it to replace gluten in bread. But, it’s much more than that. Gums work as stabalizers and thickeners. You will see them as an ingredient in salad dressings, BBQ sauces, ice cream (it helps with the crystalization), instant pudding, etc. 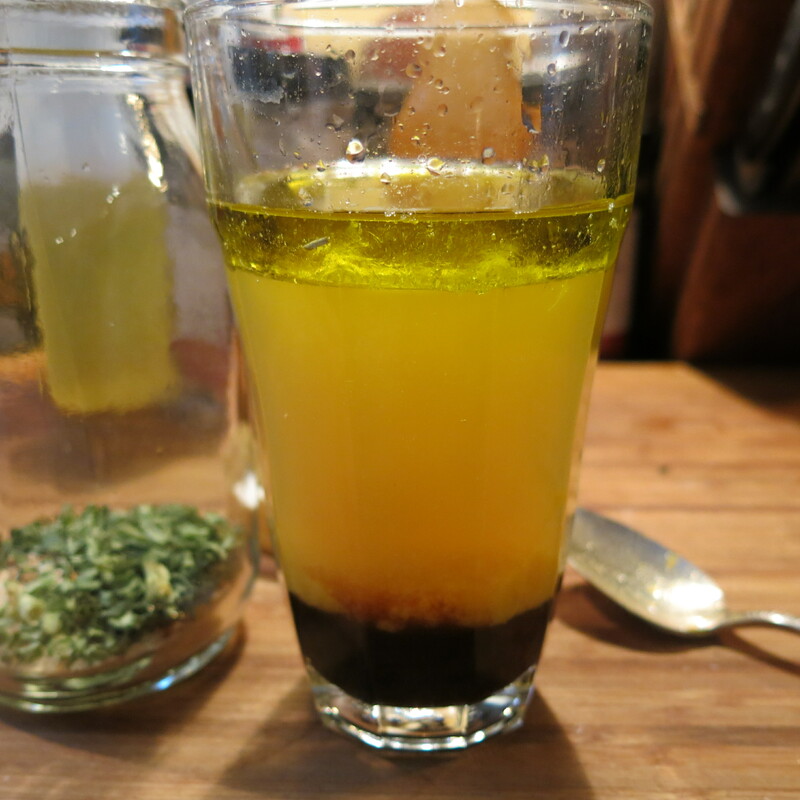 But today, we’re talking a lower calories vinaigrette. This is for those of us who like a little salad with our dressing, but don’t want quite all those calories! We want it all…flavor and fewer calories. In essence, you are replacing most of the oil with water and the gum acts as an emulsifier. It is much more stable than the oil/vinegar/water combination; your dressing won’t separate and the dressing will have fewer calories. This vinaigrette has tons of flavor. I really took some liberties here, as I had a couple of things I simply wanted to get out of my cupboard. 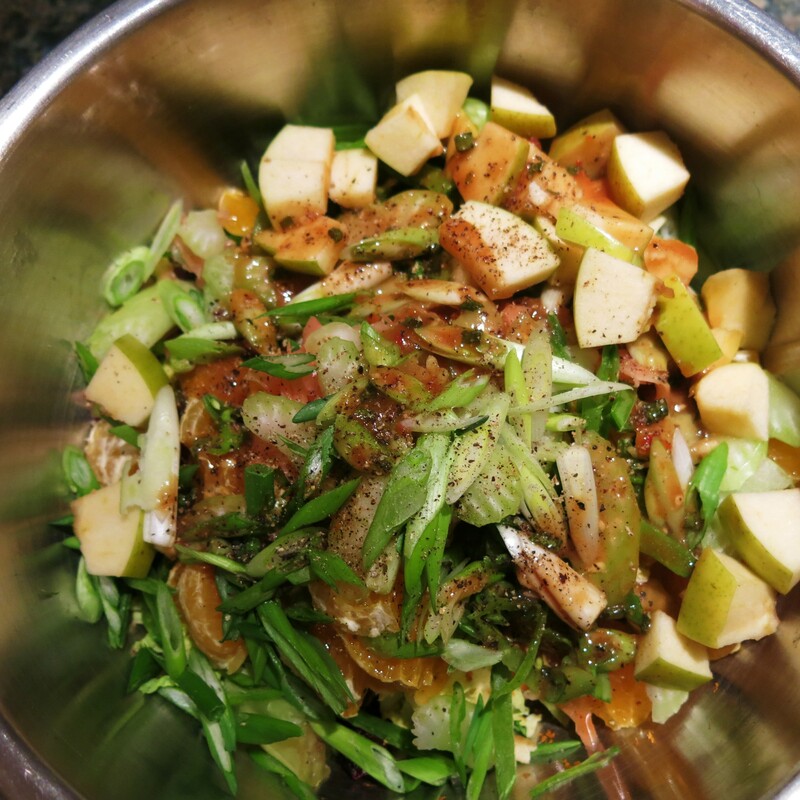 Besides, they work just fine in a vinaigrette and with the ingredients I’m using in the salad; citrus, celery, toasted nuts and dried fruit, combined with leafy greens. This vinaigrette is very good with a cabbage-based salad, as well. 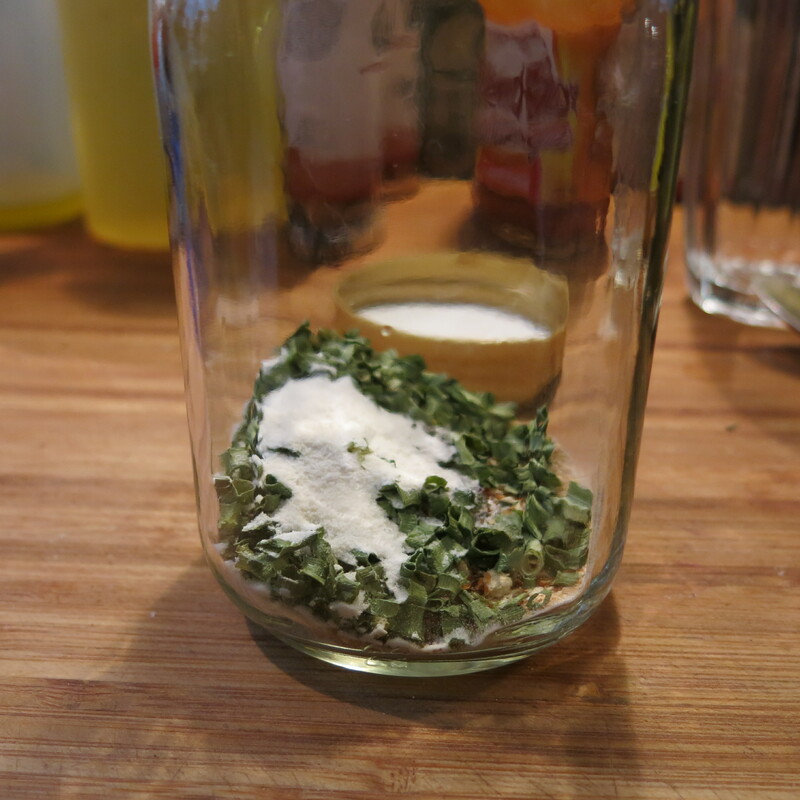 Combine the dry ingredients in a pint jar (2 cup capacity). Make certain the xanthan gum is mixed with the other dry ingredients, as it has a tendency to clump when it comes in contact with liquid…it really, really clumps! Combine the liquid ingredients; pour all at once into the dry, cover tightly and shake like a mad person. Taste and adjust the acidity/sweetness levels to your liking. Cover and refrigerate for at least 1 hour before using, to allow the flavor to combine. Mixture will thicken as it stands. 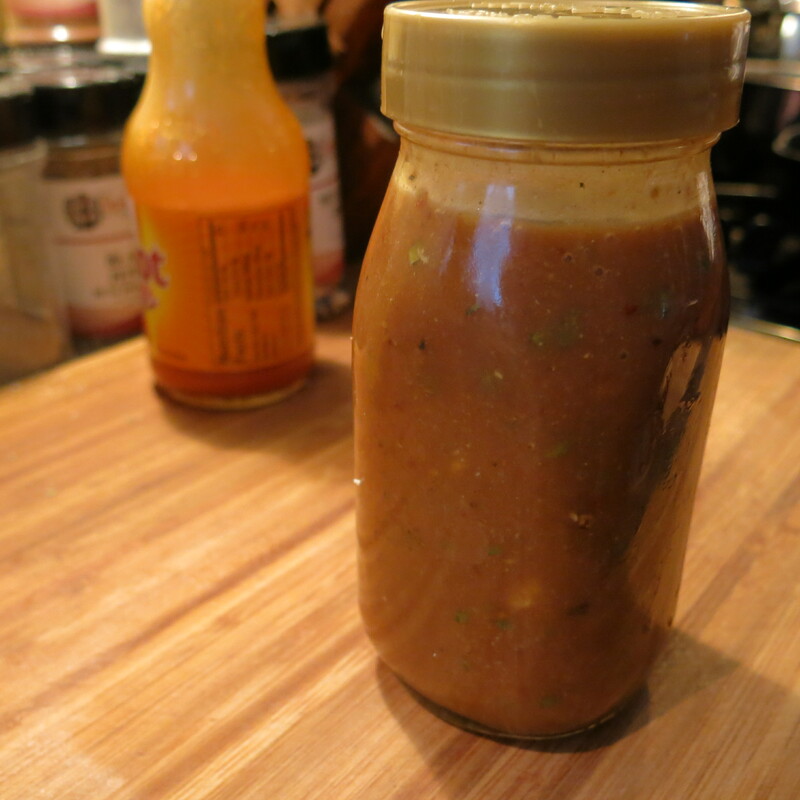 Less-is-More Vinaigrette Recipe©Marcia Lahens 2015. All rights reserved. That’s the basic recipe. In this particular rendition, I added a couple of tablespoons of ketchup, because I had a bottle that had that amount left in it and I wanted to get rid of it. I used a mixture of lime and pomegranate juice for the acid, with just a bit of white balsamic vinegar; I used 5 tablespoons total acidic ingredients. I also added about 2 teaspoons Dijon mustard, because I like that and an additional 1 tablespoon of maple syrup, because The Latin Lover likes a sweeter dressing. When you use xanthan gum it is imperative to combine it with dry ingredients. If, by the way, you spill some. Whatever you do, DO NOT use a wet sponge or dishcloth or anything with water to clean is up. It clumps and is just nasty to try to clean. I simply brush as much as I can away and THEN, wipe with a damp cloth. Xanthan and/or guar gums can be a bit difficult to find, but The Spice Mill does carries a version that combines the two and that’s what I used here. Just remember, little goes a very long way. Next, I find it works best to add the wet ingredients all at once; just pour it in. Then shake the mixture like a mad woman/man or use a blender or immersion blender. It combines, but you will need to let it stand for awhile. It will thicken as it stands and when you use it on a salad, I think you’ll feel that it contains much more oil than it does. It actually has a pretty good mouth feel; unctuous and smooth. So, we have a good vinaigrette that has a fraction of the calories and all the taste of a full-fat dressing. You may also choose to use this as a marinade or a dip for veggies…I truly do love to have options!